Nicole Loher is a triathlete, Adidas ambassador, and all-around fitness guru, all while balancing a badass day job in the fashion industry (and several side gigs to boot). Needless to say, she’s an inspiration in the art of hustling—and she’s totally game to share her knowledge. 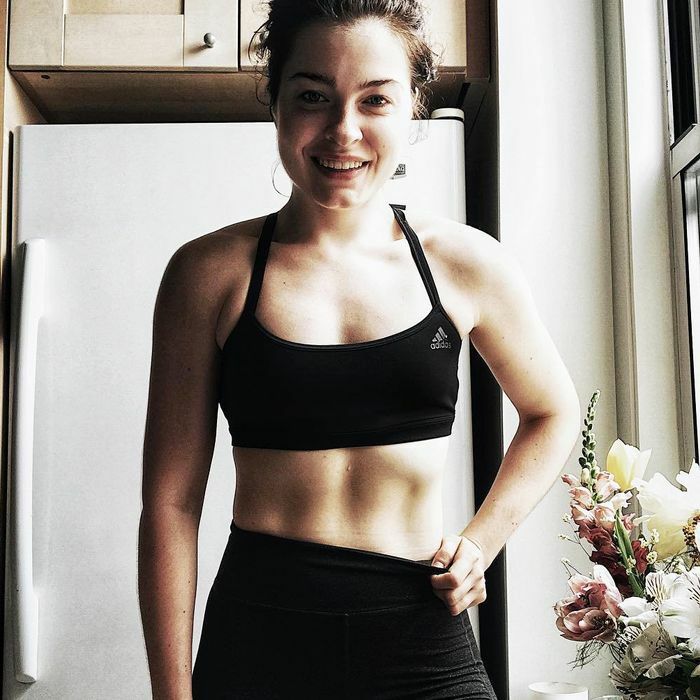 Follow her column, Part-Time Athlete, for her expert advice on everything from establishing a training regimen to finding early-morning gym motivation. To kick things off, she shares her personal wellness journey below. You’ve probably seen it all over your favorite fitness influencer’s Instagram Stories or the front page of the wellness site you visit every day, and chances are you’ve seen it served in latte form if you live in L.A. or NYC. So what is CBD? To keep things simple, CBD (or cannabidiol) is one of at least 113 cannabinoids—a class of diverse chemical compounds that interact with receptors in our brains—identified in cannabis. I have to say I was quite shocked when CBD began to get big within the wellness community. Many of my athlete friends have been regularly using CBD-infused treats or popping a CBD pill before a long run just to ease into their workouts (because no, it doesn’t get you high). It was about a month ago when a Pilates-loving colleague of mine turned to me and asked, “Have you ever tried CBD during your workouts?” I had to stop and think for a moment, not because I couldn’t remember, but because I was internally questioning why I hadn’t tried pairing my notoriously long training sessions with CBD. I gave my brother a call that day—he lives in Colorado and has been a long-time advocate of cannabis. As someone who doesn’t exactly partake in the extracurricular of smoking weed, I had a lot of questions: Was I going to get high? Is it even legal? What will happen? What’s the best way to take it? Is there any research behind this? Are you sure I’ll be able to run? My brother laughed at first, which felt like an insult, but he explained everything to me ensuring I felt super confident before agreeing to put myself through some sort of Tim Ferriss–esque experiment. For starters, CBD won’t get you high and you won’t experience the same sensations as being stoned, because CBD lacks the same compounds as THC, the cannabinoid with the power of producing those sensations when you smoke or ingest weed. Likewise, because CBD can’t get you high, it is technically legal. From stopping seizures to reducing inflammation and relieving pain, CBD continues to get praised in the health world—with lots of promising science behind it, too—which is how it ended up in the wellness junket. But sometimes all you need is a little familial nudge, and after about an hour of questioning my brother, I felt confident to make the leap. I purchased a tincture of CBD oil for my pre-workout coffee, a topical CBD cream for post-workout pains, and CBD-infused gummy bears because, well, gummy bears are delicious. My brother made it very clear upon sharing my purchases with him: The goal was to NOT try all these items at once. So now I know you’re wondering: How did it go? I’d be lying if I didn’t say I kind of enjoyed it. To be transparent, I sat on these items for a few before I gave them a go. I tried the tincture first. Though you’re supposed to place the oil under your tongue, I found mixing the oil with my coffee worked well before a long run. With no scent and no taste, it went down easy. Within 30 minutes, I was feeling pretty loose. I typically have a bit of anxiety before a long run—I always question if I’m ready or if I’ve done everything to prevent injury—but these feelings kind of got pushed to the wayside. As I got into it, I felt comfortable as I ran a really solid 10 miles that morning and certainly with a little more ease than I normally would. About three hours after the initial ingestion, I felt pretty “normal” again. All along, my brother was super diligent in reminding me that you can always take more, but you can’t take less. While you can’t overdose on CBD, he warned you can definitely take too much and feel not so great from doing so. Later that night, after a lot of food, a nap, and an Epsom salt bath, I gave the topical salve a go on my knees—a pretty common trouble spot for me after a long run due to tendonitis. I felt a “relief” sensation almost immediately and for hours after that until I went to bed. It wasn’t like I could go out and run again immediately, but I definitely was happy to not be in so much pain and went to bed about two hours later. My brother also favored this topical cream, which he used for almost instantaneous relief when he fractured his spine. Like nutrition, exercise, and anything else, every individual’s level of tolerance differs. For that reason, I haven’t tried the gummy bears, as their recommended use is for “full-body relaxation” for sensations like generalized pain. Because I felt so impacted by the first two trials and wasn't experiencing pain all over, I decided to not give the gummy bears a go. The final verdict: My skepticism was high, but CBD did everything I hoped it would do. But as an athlete who feels pretty competent in my sport the “natural way,” I’m not sure this is something I’d be able to keep up. Have you tried CBD before? I’d love to hear about your experience. Until then, be well. Curious about making the leap into cannabis? Check out the products we recommend, no matter what kind of buzz (or not!) you're looking for.